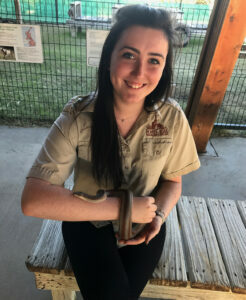 It was impressive in itself that the stars aligned for Caitlin Bloomer to get her opportunity as a conservation education intern at Fossil Rim Wildlife Center, but then she capitalized on the experience to gain clarity in her professional future. The native of Downpatrick, Northern Ireland was at Fossil Rim from July 3 to Nov. 16. Fossil Rim Conservation Education Intern Caitlin Bloomer helps guests of the Children’s Animal Center get to know “Dolores” the rosy boa. 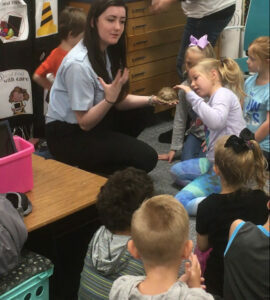 The Northern Ireland native spent four-and-a-half months boosting Fossil Rim’s education team. “I was visiting Texas in January and came down to Fossil Rim; I thought it was pretty cool,” Bloomer said. “My boyfriend, who I met at the University of St. Andrews in Scotland while we were both studying biology, is from Fort Worth. I came over to visit him, and he thought Fossil Rim was a perfect place to go for two people interested in biology. Over the course of four-and-a-half months, Bloomer embraced the bevy of education-related opportunities that arose. She pointed to some Fossil Rim moments that have remained at the forefront of her mind. “First, I think of when we heard a radio call that the giraffe we now call ‘Cornelius’ was about to be born,” Bloomer said. “So, we took a vehicle down and saw the moment he was actually born in the pasture, which was really awesome. Also, I wrote my own education program – ‘Lorax: The Sequel’ – and saw it implemented with a group of Girl Scouts who really took to it. It was an exciting moment of pride to see them improvising off of something I created. 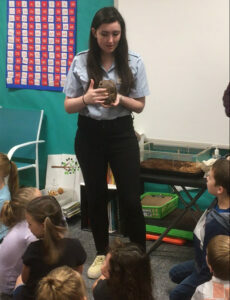 Caitlin Bloomer does an outreach program at Acton Elementary with “Alastor” the Eastern box turtle on Halloween. As it turns out, her Irish accent came in handy sometimes. Bloomer pointed out some of the animals she had become especially fond of. 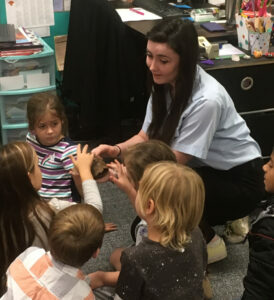 The recent college grad appreciated the staff for helping her build a foundation of factual Fossil Rim information so she could do the same for children inside and outside the facility. Looking down the road, Bloomer seems to have found her calling. On that note, she learned how to tackle the challenge of holding a child’s attention. “One of the biggest things is absolutely thinking on your feet,” she said. “Whenever you are teaching a class with young kids, you never know what is going to happen. If they want to know about something that isn’t necessarily the focus of the class, you have to be able to teach wherever their interests lie, because they are like little sponges and they’ll soak it all up. Also, being really enthusiastic is important, especially when you are teaching about environmental issues. 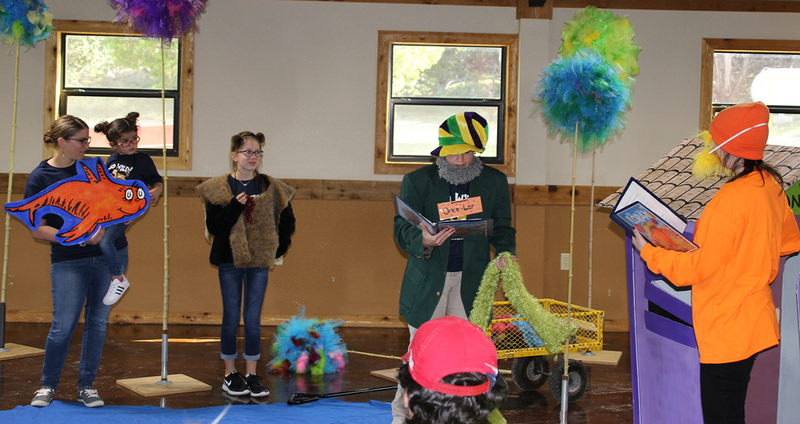 Caitlin Bloomer (far right) performs “The Lorax” with the education team for children facing medical adversity during Fossil Rim’s event for a Wish with Wings and Ronald McDonald House Fort Worth. Her efforts for the education department were not lost on the staff. If someone is contemplating jumping into the conservation education intern experience, Bloomer would tell them to take the leap. Many people may think of feeding animals when Fossil Rim comes to mind, but Bloomer hopes they will dig deeper.